✴The older of the two confraternities was the Confraternita di Sant' Andrea della Giustizia, which had been formed in 1374 to give spiritual support to condemned criminals. The brothers had acquired some property near Porta Santa Susanna, next to the small church of Santa Mustiola, in 1436 and had taken over the church itself in 1454. (A community of Capuchin nuns built the church and nunnery of Santa Chiara on the site of Santa Mustiola in 1552, and the brothers administered their temporal affairs until 1566). ✴The second was the Confraternita di San Bernardino, which had been formed in 1456 and had had on oratory at Santa Maria dell’ Oliveto, near Porta Eburnea. The box-vaulted ceiling was carved and gilded in 1588. Most of the paintings that remain in the oratory are from the 18th century. The inscription on the bak wall records the transfer of the confraternities to this site in 1537. This altarpiece on the high altar, which is by Gaetano Lapis, depicts the Madonna and Child with SS John the Baptist, Andrew and Bernardino of Siena. This triptych from was generally attributed to Fiorenzo di Lorenzo until Michael Bury (see the page on either artist) discovered a document in the archives of the Confraternita di Sant' Andrea della Giustizia that records its commission from Bartolomeo Caporali and Sante di Apollonio del Celandro. The altarpiece was originally in the confraternity's church of Santa Mustiola, and it moved with the brothers to the Oratorio di SS Andrea e Bernardino in 1537. It was given to the Commune before 1872 and entered the Galleria Nazionale in 1895. Recently discovered documentation records that the Confraternita di San Bernardino made a payment to Perugino in 1496 for the painting of a processional banner, for which the confraternity received a donation from the Commune. This banner would have been kept in the Oratorio della Confraternita di San Bernardino near Porta Eburnea until 1537, when the confraternity merged with the Confraternita di Sant’ Andrea and moved to the Oratorio di SS Andrea e Bernardino. The banner was moved to the Galleria Nazionale in 1879. ✴One pair came from the Oratorio di SS Andrea e Bernardino in 1863. ✴Cappella del Gonfalone, San Francesco al Prato in 1909, the year in which the chapel was closed. Modern scholarship has determined that the panels were originally arranged in pairs, one above the other, and that they probably decorated two sides of a tabernacle. All of the angels would have looked inwards towards whatever was housed in the tabernacle. 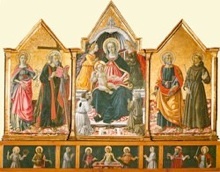 The presence of two of the panels in the Cappella del Gonfalone suggests that the tabernacle might have housed the Gonfalon di San Francesco al Prato (1464), which is also attributed to Benedetto Bonfigli. This banner, for which the chapel was built, is now in the Oratorio di San Bernardino. See also: Other Oratories in Perugia.